The application is open until February 4, 2018. Conformal field theories (CFTs) are a cornerstone of modern physics; they are a basic tool for all condensed matter theorists and many particle physicists. 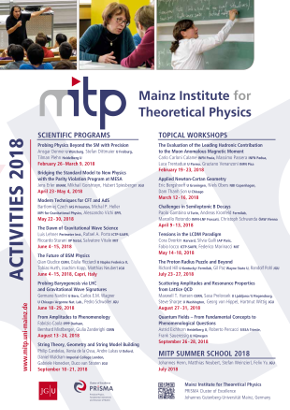 The last two decades have revealed that certain CFTs have a fascinating bonus application: under the holographic duality (the AdS/CFT correspondence), they encode the quantum dynamics of gravitational systems, enabling the study of quantum gravity and the unitary of black holes in controlled settings. At the same time, the structure of CFTs is so tightly constrained that it is possible to derive many facts about them from self-consistency and unitarity alone. The attendant effort to characterize and classify all CFTs is known as the bootstrap program. Until recently, the bootstrap program and the AdS/CFT correspondence have mostly developed as two independent and complementary fields. Luckily, this has begun to change in the last few years – in part because both those research enterprises had made sufficient progress to make contact and in part due to several breakthrough insights. The goal of the proposed program is to nurture the current convergence of the bootstrap program and the AdS/CFT correspondence, to use insights from one to foster progress in the other, and develop new joint tools for exploiting conformal symmetry. An example of such a tool is the kinematic space: a formalism invented by two of the organizers which clarifies the manipulations carried out in bootstrap calculations, but which also provides an efficient description of the gravitational dynamics of the dual anti-de Sitter (AdS) spacetime.